2019/2. 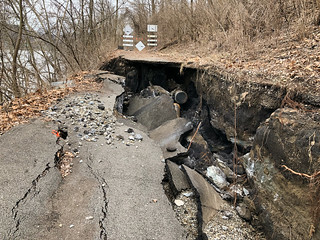 Duck Hollow Trail about .7 mi from parking lot, after water main break. There's a crack in the ground about 350 feet long and 5 to 10 feet deep between the railroad tracks and the trail. The land downhill of the crack has slumped toward the river, dropping up to 10 feet and sliding laterally for up to 10 feet. I wonder whether this is rainfall over several years causing slumping causing water main break, or slow water main leak for several years causing slumping causing big water main break.